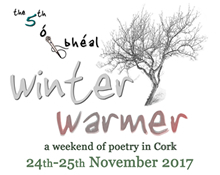 The 5th Winter Warmer festival was the biggest yet and found its full stride in its new home, The Village Hall, a fantastic venue overlooking the Lee. With fine audiences and cheer throughout the weekend. The playlist of 33 videos is on Ó Bhéal’s Youtube channel, right here. 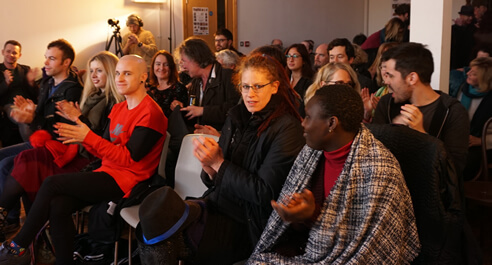 Exemplary readings and performances by guests Edward O’Dwyer, Niamh Prior, Richard Lambert, Frank Golden, Keith Payne, Jen Matthews, Biddy Jenkinson, Brendan Cleary, Ken Marshall, Órfhlaith Foyle, Felicia Olusanya, Stephen James Smith, Inma Moya Pavon, George Harding, Caitríona Ní Chléirchín, James O’Sullivan, Mary Noonan, Daniel Salgado, Rody Gorman, Stephen Watts, Billy Ramsell, Adnan Al-Sayegh, Stephen Sexton, Catherine Ann Cullen and Sophie Mayer, along with poems from the closed mic session by Julie Aldridge, Ali Bracken, Shaunna Lee Lynch, Rishtí Mac Piarais, Jim Crickard, Mel White, Megan Cronin and Grace Piotrowski. 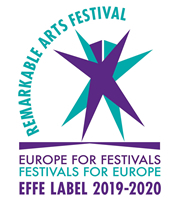 With thanks to the festival sponsors and to the fabulous, ever-expanding team of volunteers. A truly communal effort and brilliant result. With thanks to Shane Vaughan for the excellent videography and editing. The Natural Foods Bakery, The Quay Co-op and Paradiso.